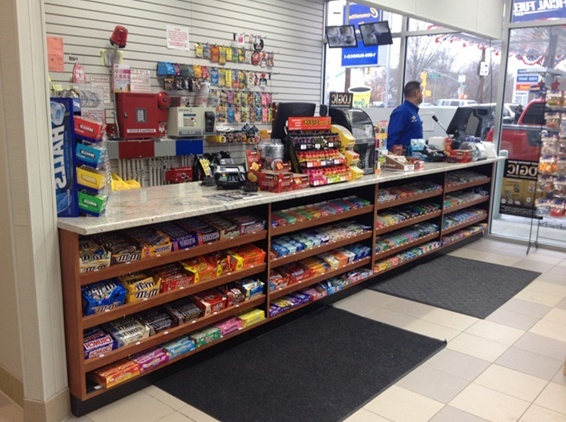 Counter space is the most valuable space in most retail stores for three primary reasons. First, it generally represents a very small part of an overall store’s footprint. Its scarcity is a key driver of its value in the same way that beachfront property is more pricey than inland real estate. Second, it tends to get more shopper traffic than other areas of a store, particularly if it is located by the checkout area. Third, it is one of the best places to drive impulse sales, particularly again if it is by the checkout area. Today’s blog is the first in a 3-part series on retail counter displays in which we’ll show lots of examples of effective countertop POP displays that are designed to drive sales. Because counter space is so limited, these areas are frequently marked by clutter and layouts that are significantly over-merchandised. This is almost always true in areas around the cash register where retailers mistakenly think that overstimulating shoppers who are waiting in line will somehow result in above-normal impulse sales. The result is generally a sea of generic chipboard boxes mostly filled with products that are not good for you. If you have a product that is a good candidate for retail counter space, the challenge then becomes how do you stand out from the cutter. Rising above the noise is really at the heart of this blog series on retail counter displays. In the course of this series we will share a fairly wide range of retail counter displays for many types of products. We’ll also give examples of displays made out of different materials such as wood, metal, and acrylic. Let’s start by looking at wood counter displays. Our first example is a countertop display we made for La Loop, maker of premium eyewear necklaces. Our assignment was to come up with a spinning, high-end wood counter display to showcase our customer’s eyewear necklaces. We made the display shown below out of solid walnut with a dark stained finish. 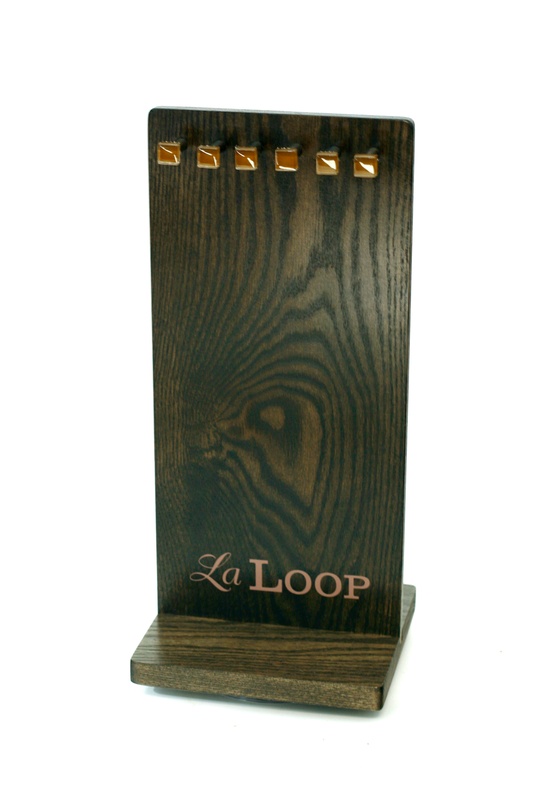 We screened printed the La Loop logo and used gold plated hang bars on both sides to hold the necklaces. Three design elements were primarily responsible for helping to create high perceived value for the product: (1) We used thick wood. (2) The dark stained finish on the walnut wood gave the display a rich feel. (3) The gold-plated hang bars provided an upscale look, particularly because they stood out against the darker wood finish. 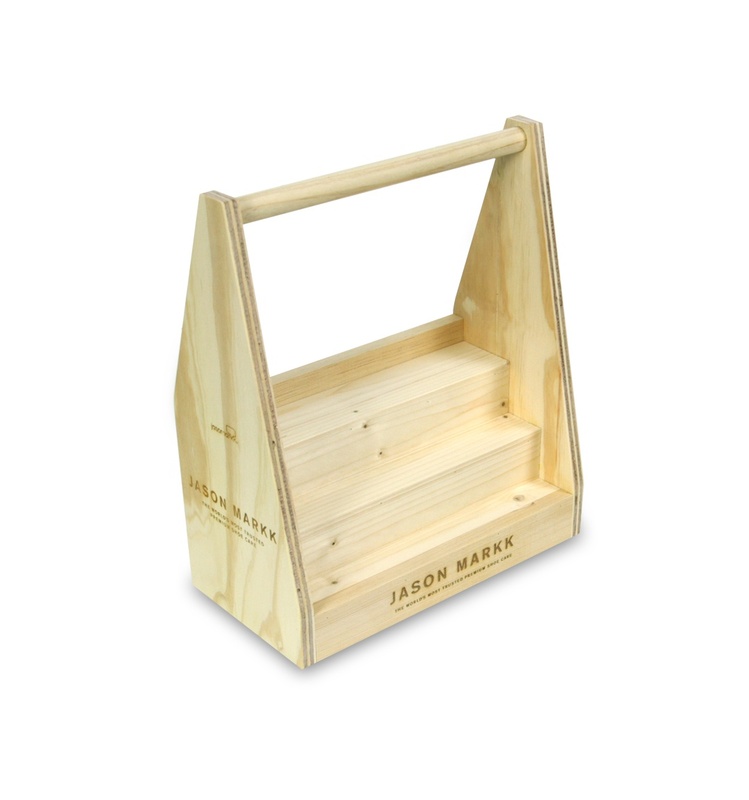 Our second example is a countertop tool box we made for Jason Markk, a premium shoe care products company. This 3-step toolbox merchandiser is made out of unfinished high-grade layered plywood. It has a distinctively natural or “raw” look which helps it to stand out in a retail environment. We laser engraved the Jason Markk brand on the sides and front of the merchandiser. Our first two examples were made of solid wood of plywood. Our third example is made of MDF which we painted white. MDF is a common wood composite material that is frequently used in the POP display industry. 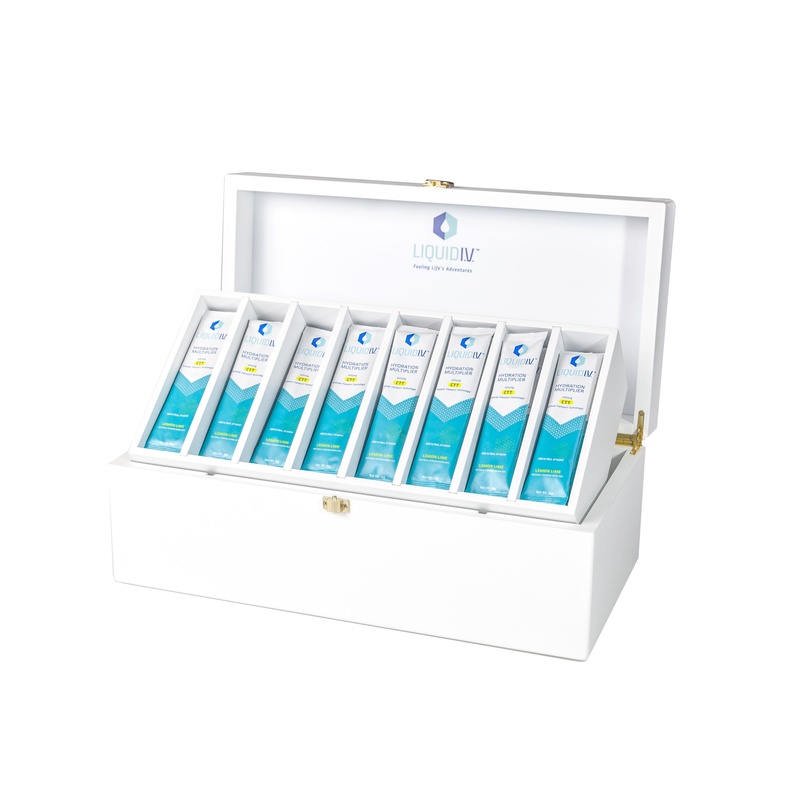 The countertop display box shown below is one we made for Liquid I.V.’s line of electrolyte drink mixes. These drink mixes act as a hydration multiplier and can deliver hydration 2-3 times faster than water alone. The display was intended for the high-end hotel market. We created a box that could also serve as a countertop display when opened. We built individual modules to keep the packets organized, added screen-printed branding, and used gold-plated hardware to give the display a premium look. 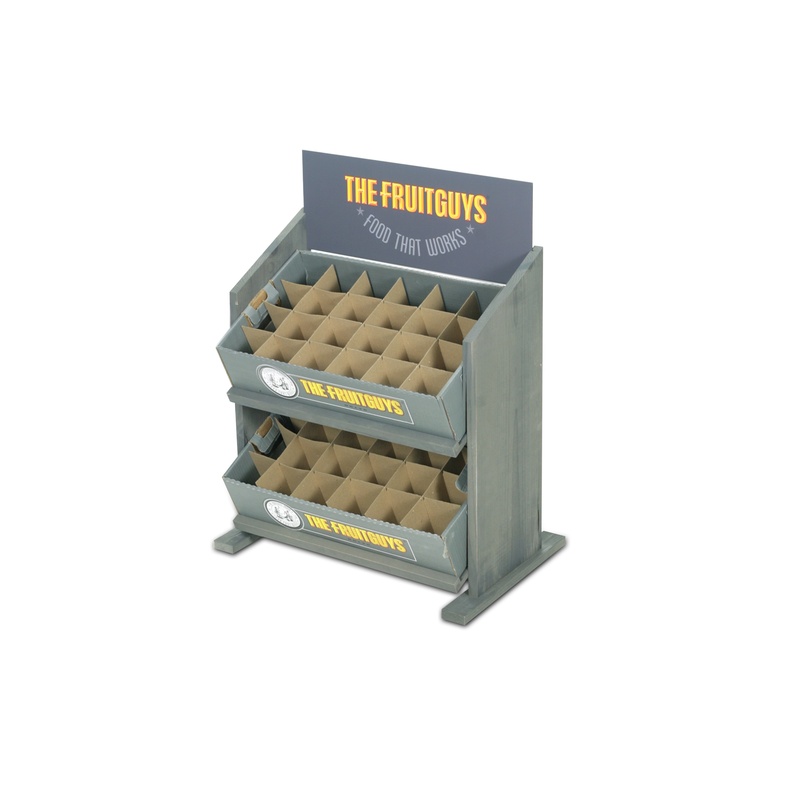 Our fourth example is a 2-shelf counter display we designed for the Fruit Guys. We constructed this display out of solid pine which we finished with a grey wash to match the corrugated branded boxes that are used to ship the company’s fresh fruit. We designed slanted shelves to enable greater product visibility and cut a sign channel in the rear uprights for a header sign. This type of display works for many types of boxed product. 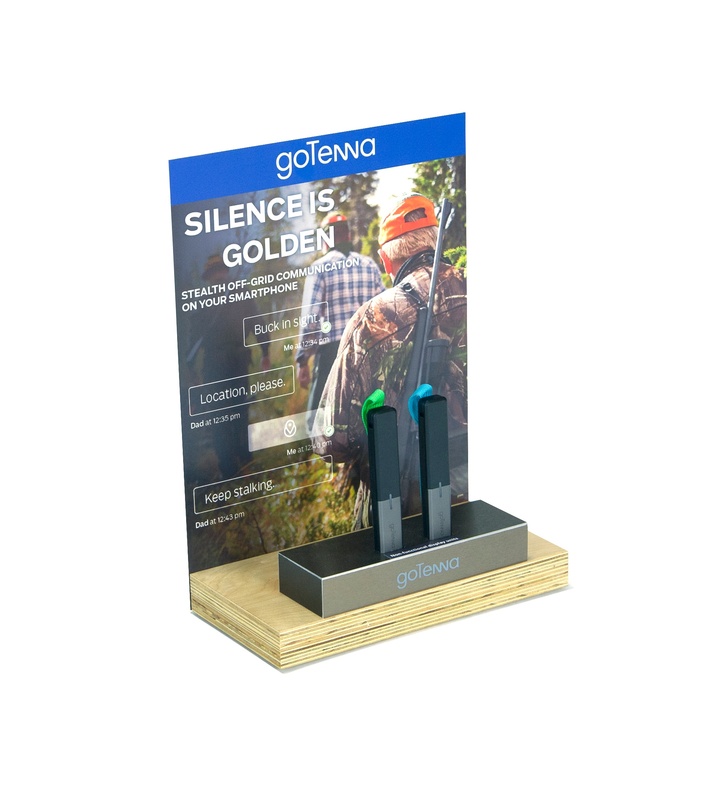 Fifth, the example below is a simple countertop glorifier to showcase goTenna's mesh devices which enable the use of texting and GPS when no phone service is available. We used a thick plywood base with a laminated glorifier box which we designed to hide the tethers that we used to secure the demo product. We added branding to the front of the box and cut a channel in the back of the base for a digitally printed PVC header sign. This display offered a cost-effective solution while also fitting the outdoor aesthetic. Our sixth example below shows another type of material we frequently use for POP displays- bamboo. 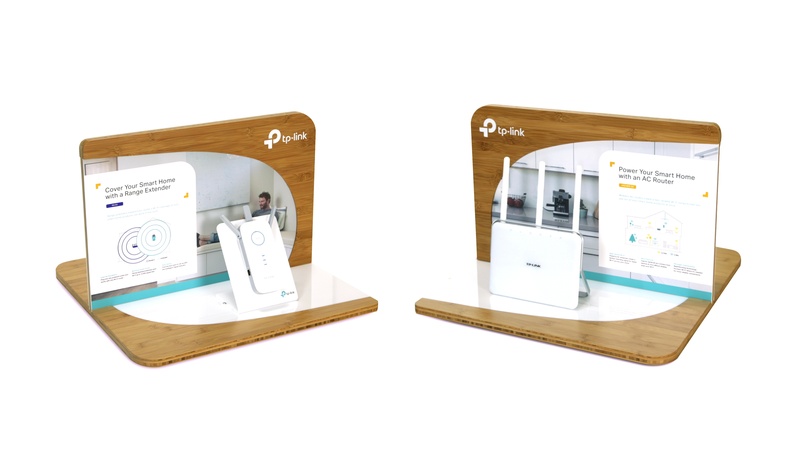 We designed this counter display for TP-LINK. We used carbonized edge-grain bamboo for the main structure and created a recessed area in the bamboo in which we added white acrylic. We secured the product to the display and added a die-cut PVC back panel graphic and a screen-printed logo. The pictures below show two sides of the same display. 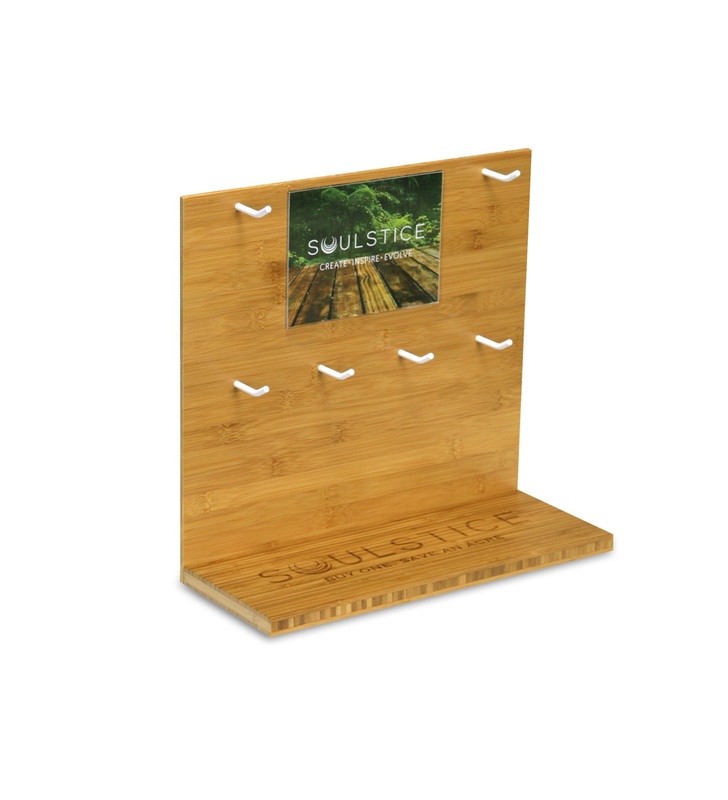 Our last example today is another bamboo countertop display that we made for Soulstice, an eco-conscious lifestyle apparel brand. Since bamboo is environmentally-friendly and highly sustainable, the material fit really well with the company’s ethos. This display was specifically made for a yoga apparel item, and like the previous example, we used clear coated carbonized bamboo. One of the things we like about using bamboo is that you can celebrate the edges rather than cover them up. In fact, the edges of solid bamboo are one of the things that give the material the most interest and character. We laser engraved the logo on the base to be consistent with the natural theme. We added fixed single peg hooks and an acrylic sleeve for a slide in graphic. Hopefully, today’s blog whet your appetite for retail counter displays. In Parts II and III of this series, we will explore additional examples of displays that are designed to increase sales and build brand awareness.